WhatsApp is most of using the massaging app in the world. 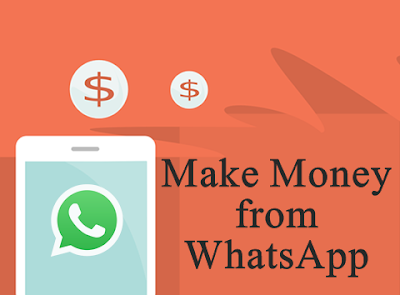 When we are going to discuss some way to earn with WhatsApp, that case does not pay you directly but there some indirect way to make money from whatsapp. You make good money but it totally depends on your hard work. If you have good WhatsApp contact list and you won't make money through whatsapp by using contact list. Then make all on one broadcast list or join them on groups. After you generate product link share with your broadcast list and a small description. Write some reviews about a product that can help you to boost you’re selling. Affiliate is the best earnings method to earn money on whatsapp. Affiliate means you help company for selling their product, for that selling company gives you some commission. Some are affiliate companies pay you for per lead. Amazon, Flipkart as like company give 2% to 10% commission. For join any affiliate programme, you have to sign up with your account. After creating your account choose any of product which is match with your audience. After choosing your product company to provide you one link to share with your audience. Simply share that link with your whats app contact. If anyone interested in that product, they will directly click on that link and buy from the company. For that you get a commission. Also known as link short. That is very effective, but very low-income source. If you have good contact or you connect large WhatsApp group, then you can easily earn 50$ monthly. You actively follow internet and you got lost some information that is wanted all. Like whatsapp status download, viral content. Just copy that link and paste to link shorter create. Send with all group and contact. You just want to select best link shortener that pays. There are many websites, some are fake but some legit. So before starting your work check website authentication. If you have all local contact or local group on your whatsapp. Or you can create with simple steps. Then you start your local marketing work. There are many store and small business open every day. You just contact them ask for your proposal. Send their company profile or make company banner and send it to all group. That makes good marketing for products. So that is one of the best way to make money through whatsapp. Every small business wants a good lead for selling their products. Every company spend more than expenses for making their sell and generate a lead. But in that case, you can make a lead programme for local brands. As like construction and real estate companies spending lost some money for generating a lead. They are doing banner ads, Display ads and many for generating a lead. In that case, you can approach them for providing a lead. You can ask them for pay per lead or pay per sell. Its totally depend on you and company. PPD means pay per download, as per website required they will only pay you if a user downloads your uploaded file. So you have to upload viral content as a like game, Movie, software, etc. After upload your file there one link generates. That link you want to share your whatsApp group and contact. Remember the PPD network paid for per download. There are many apps in Google play store and they want to people download and use. For downloading apps company spend money. You can also be part of that, simply you have to sign up and share the link for download. Remember they do not pay you direct money but they give you a small token with recharge coupon and other rewards. For just referring application. Maybe you can’t forward your message to 5 users. In that case, you make one broadcast list and add your all contact in the same list. When you send any message in that list it's automatically delivered to all user. So that is some way with you make money through whatsapp.